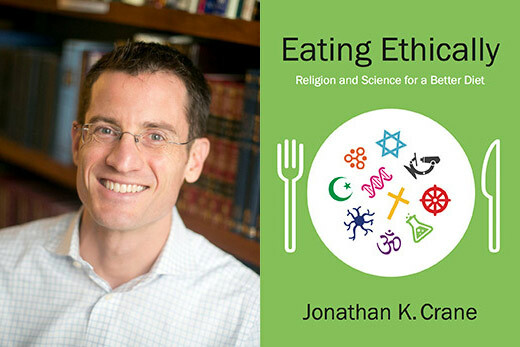 Jonathan K. Crane, Raymond F. Schinazi Scholar in Bioethics and Jewish Thought at Emory's Center for Ethics, uses philosophy, physiology and theology to explore contemporary eating habits in his latest book, "Eating Ethically: Religion and Science for a Better Diet." When Emory bioethicist Jonathan Crane began researching his latest book, “Eating Ethically: Religion and Science for a Better Diet,” he decided that one of the best ways to gain inspiration for such a vast, multifaceted topic was to introduce it in the classroom. “I wanted to explore these issues alongside my students,” Crane says. He eventually created three courses on the theme, the first one lecture-based with Crane as sole professor, the second a team-taught course with colleagues from anthropology, law and public health. For the third class, funded through Emory’s Center for Faculty Development and Excellence as a university course, undergraduate and graduate students from across Emory competed last spring for just 20 slots. Crane was joined by a dozen guest lecturers, also from across the university, who were experts in their fields. “Eating Ethically” began as an op-ed Crane wrote for The New York Times in 2013. His column, titled “The Talmud and Other Diet Books,” stemmed from his interest in eating-related issues, specifically obesity and other major health problems confronting huge segments of the population. From that springboard, Crane integrated religion, philosophy and the science of eating/metabolism to explore an array of questions both in the book and in the classroom: Why has our eating become so troublesome? What does it mean to be full? How can we make contemporary eating more adaptive, healthy, ethical? One of the most powerful stories illustrating this point comes from an Islamic textual tradition that describes a competition among sages from different civilizations, says Crane. Each sage was challenged to describe a medicine that results in no sickness. According to the text, the final sage’s answer is deemed to be the best: to refrain from eating until you are actually hungry and to stop eating before you are full. Plus, many of the foods in the American diet are what Crane calls “hyper-palatable” (very tasty), stuffed with salts, sugars and fats, or manufactured synthetics meant to imitate the flavors/textures we crave. What’s more, “evolutionary biologists have shown that human brains exploded in size concurrently with increased use of fire,” he says. All that delicious, digestible cooked food made ancient peoples stronger and smarter. But many religious faiths also require fasting on occasion. “What I’m suggesting is that those feasting activities ought not be our daily activities,” says Crane. “During the rest of the year, we need to east less than what we bodily can,” which is the difficult part. “Our contemporary food environment encourages us to eat according to external cues,” he explains. Cues include everything from food ads and restaurants’ serving sizes, to the accepted timing and content of meals and even the way foods are priced. Of course, none of these external cues will be disappearing anytime soon, and Crane isn’t expecting anyone to unlearn external food cues, but he’s hoping we could learn or re-learn some internal ones. For Crane, it all comes down to the eater.